St. Gianna Beretta Molla is an inspiration to many people around the world. As a physician, working mother, professional woman, and devoted wife, she testified to God’s loving plan for humanity. On October 4th, 1922 St. Gianna was born to Alberto and Marie Beretta in Magenta, Italy. The family had thirteen children, nine of whom survived until adulthood. St. Gianna began her study of medicine in November of 1942, only months after her mother died at the age of fifty-five. In 1949, she opened a medical office near her hometown in the hope of practicing pediatrics. Just after receiving her degree, she contemplated whether or not to join her brother in Brazil as a missionary offering poor women gynecological services. St. Gianna decided to remain in Italy, later meeting her future husband Pietro. In September of 1955 the two were married. Not long after, their son Pierluigi was born in 1956 followed by their daughter Maria Zita in 1957, and their daughter Laura in 1959. While pregnant with the couple’s fourth child, St. Gianna was diagnosed with a uterine tumor. The doctors treating her presented her with three choices: have an abortion, which would save her life along with preserve her childbearing years; have a hysterectomy, which would sustain her life, but take her child’s life, and end her childbearing years; or attempt to remove the tumor, which could lead to complications. A faithful servant of the Lord, St. Gianna selflessly gave of her life for her daughter. She expressed her intention, “This time it will be a difficult delivery, and they may have to save one or the other — I want them to save my baby.” Shortly after her surgery to remove the tumor in September of1961, she gave birth to Gianna Emanuela on April 21st, 1962. 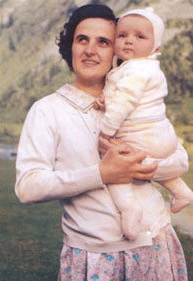 Only days after her daughter’s arrival, St. Gianna died at the age of thirty-nine. St. Gianna Beretta Molla’s devotion to human life and God prompted her beautification in 1994. Ten years later the process was made complete on May 16th, 2004 when she was canonized a saint by Pope John Paul II. Interestingly, her husband Pietro and daughter Gianna Emanuela were present during the canonization ceremony in Rome. Today, St. Gianna is the patron saint of mothers, physicians and pre-born children. The following two websites served as sources for the above article, and they also make for great resources to learn more about St. Gianna Beretta Molla.